In the April 2015 iteration of the Senior Loan Officer Opinion Survey (SLOOS), the Federal Reserve Board included a special question on residential real estate lending. That special question asked banks about how they had responded to new guidelines issued by the GSEs on November 20, 2014, on the definition of life-of-loan representation and warranty exclusions. These policies were designed, in part, to reduce uncertainty and increase transparency about the conditions under which securitized mortgages would be returned to the bank that originated the loan. In response to the new GSE-issued guidelines, and given information about only the credit score and the downpayment amount, banks’ likelihood of approving mortgage applications largely varied with the credit score. Given a consistent downpayment amount, banks were more likely to approve mortgage applications from households with higher credit scores and were less likely to approve mortgage applications from those households with comparably lower credit scores. In contrast, the amount of the downpayment, holding the credit score constant, had little discernible impact on banks’ likelihood of approving a household’s mortgage application. Figure 1 shows the banks’ likelihood of approving a mortgage application on net. The net likelihood of approving a mortgage application under a given credit score and downpayment is equal to the percentage of banks saying that they are more likely to approve a mortgage application minus the share of banks saying that they are less likely to approve a mortgage application under the given credit score and downpayment information. The share of banks saying that the approval was “about the same” is not included. As a result, a positive net percentage means that banks are more likely to approve the mortgage application and a negative net percentage means that banks are less likely to approve the mortgage application. According to the figure, banks, on net, were less likely to approve mortgage applications with a credit score of 620 and a downpayment equal to 20% of the home’s value, but they were more likely, on net, to approve a mortgage application when the credit score jumped to 680, but the downpayment remained at 20%. This pattern holds with lower downpayments. 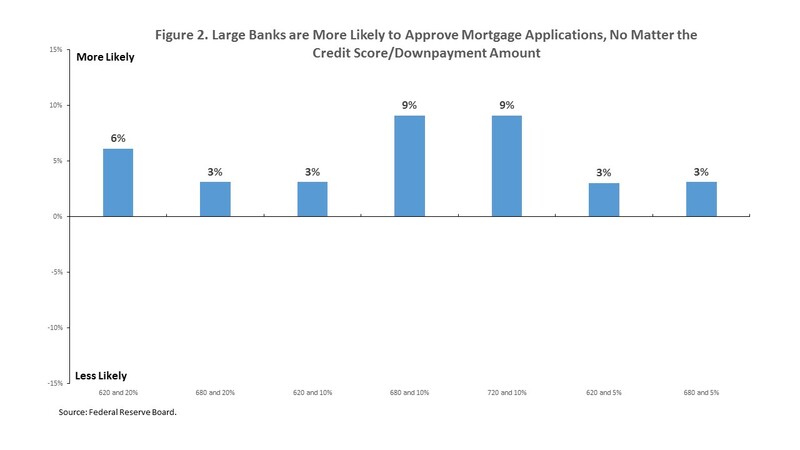 As the figure illustrates, at a 10% downpayment, banks, on net, were less likely to approve a mortgage application if the credit score was 620, but more likely, on net, to approve it if the credit score was 680, and even more likely to approve the application, on net, if the credit score was 720. Even with a downpayment of 5%, banks were, on net, more likely to approve a mortgage application if the credit score was 680 and less likely, on net, if the credit score was 620. However, no matter the downpayment amount, banks were less likely, on net, to approve a mortgage application if the credit score was 620, but they were more likely, on net, to approve the mortgage application if the credit score was 680 or above. Variation across all bank respondents masks the different responses to the GSE-issued guidelines by bank size. The Federal Reserve’s SLOOS distinguishes responses by large national banks and smaller, but not small, regional banks. Figure 2 depicts the answers provided by senior loan officers at large banks. In response to the new GSE-issued guidelines, large banks, on net, are more likely to approve mortgage applications, no matter the credit score or the downpayment amount. However, holding the downpayment amount the same, the response of smaller, regional banks to the new GSE-issued guidelines varies by credit score. 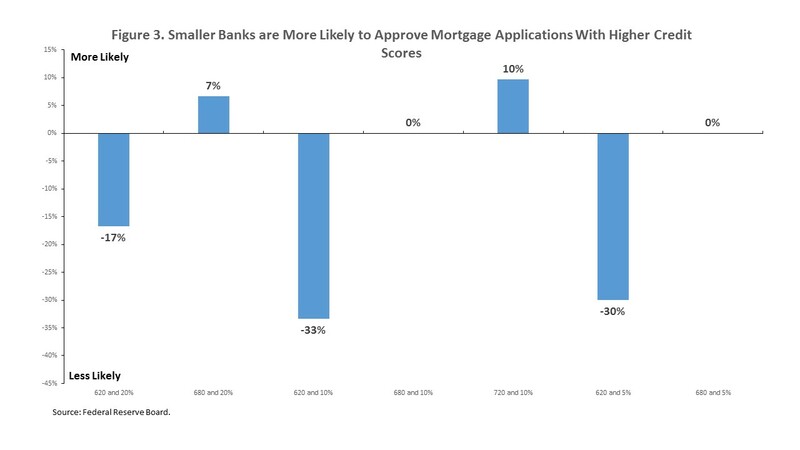 As shown in Figure 3, smaller regional banks, on net, were less likely to approve a mortgage application with a credit score of 620 and a downpayment of 20%. However, when the credit score rose to 680, while the downpayment remained the same, banks, on net, were more likely to approve the mortgage application. Similarly, mortgage applications with a credit score of 620 and a downpayment of 10% were less likely to be approved by banks, on net, but when the credit score rose to 720, banks were more likely, on net, to approve the mortgage application. At 680, with a downpayment of 10%, banks were indifferent, an equal number of banks were more likely and less likely to approve the mortgage application. 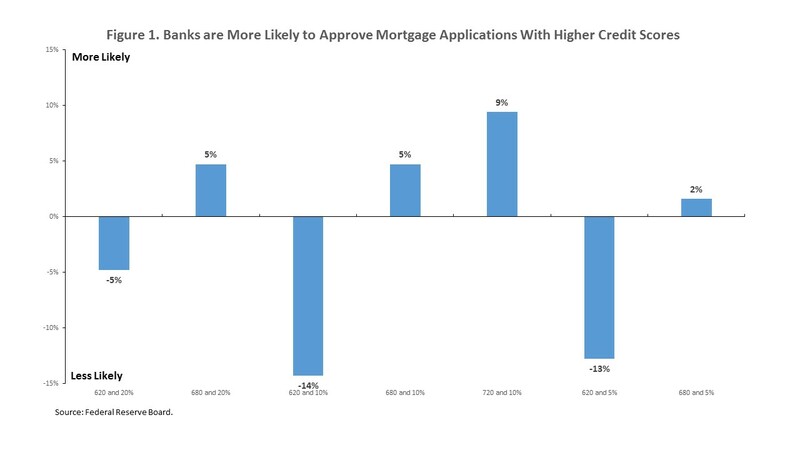 Even at a 5% downpayment banks were, on net, less likely to approve a mortgage application with a 620 credit score, but were equally more likely and less likely to approve the application if the credit score rose to 680. In addition, responses among smaller, regional banks varied by downpayment amount, but only if the credit score was sufficiently high. As shown in Figure 3, an equal number of banks were both more likely and less likely to approve mortgage applications with a credit score of 680 and a downpayment of 5%, and the same holds true for mortgage applications when the downpayment rises to 10% but the credit score remains the same. When the downpayment rises to 20% and the credit score remains at 680, smaller, regional banks are more likely to approve the mortgage application, on net. However, if the mortgage application’s credit score falls to 620, then smaller, regional banks are, on net, less likely to approve the mortgage application no matter the downpayment amount.